Between the two prints of the Boy on a Buffalo this mug bears a hand painted inscription. At the top, the initials NIA in a triangle are those of a married couple. 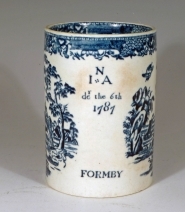 Below these initials is the date "der (for December) the 6th 1787" and at the bottom is "FORMBY", the name of a small town about 10 miles north of Liverpool. This Liverpool porcelain mug was made by Seth Pennington. It is printed on either side with the Boy on a Buffalo. Use of this print is very rare at Liverpool and, indeed, this dated mug is the only example known. This print was used earlier at Bow and at Derby. The complex border that decorates the inner and outer rim was popular at Liverpool and was used on the porcelains made at the factories of John Pennington and Seth Pennington. It is also found on earthenwares.